Wouldn't you love to be cruzin along with this sweet sea turtle in the beautiful blue reefs. This blue sea jasper is the perfect paring with this little guy. He is the work of Mc Cloud9's fabulous carvings then set in pewter. This piece is all hand embroidered by myself with high quality Japanese seed beads an amazonite. 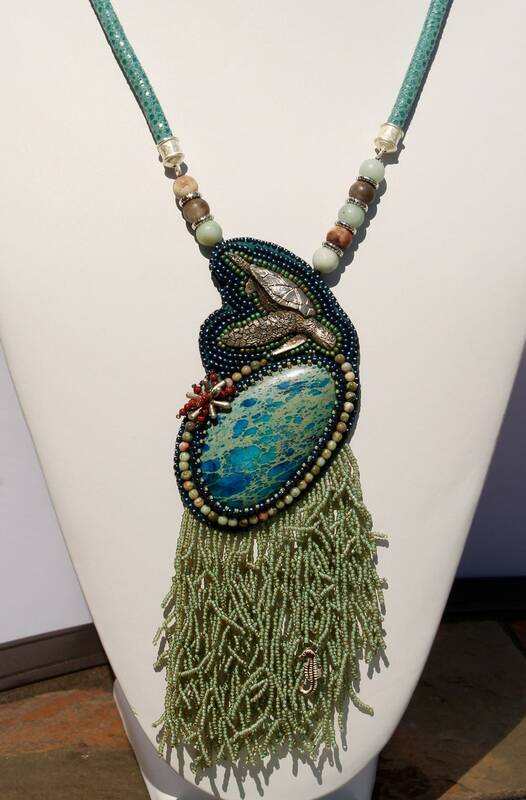 The beautiful fringe is hand beaded to replicate the form of seaweed with a tiny seahorse hiding in the weeds. 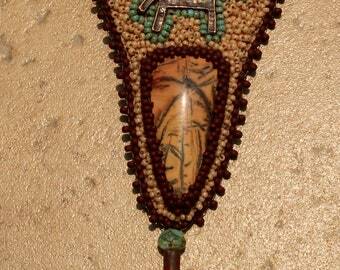 The pendant hangs from a 23" suede turquoise cord with a lobster claw closer and additional chain for adjustable length. Pedant is backed with a teal Ultra Suede.